Kate Middleton was spotted paying a secret visit to Westminster Abbey yesterday evening, sparking rumours the famous London landmark is set to play host to the wedding of the century. After the excitement of the royal engagement announcement, it was business as usual for Prince William today, as he headed back to work in Wales, leaving Kate in charge of the wedding preparations. And the bride-to-be wasted no time in getting down to business, and was spotted out and about on a number of secret missions. First up, Miss Middleton tacked the task of choosing a wedding venue, and was spied paying a super-secret visit to historic church Westminster Abbey during the evening. A royal representative spoke to confirm Kate’s visit to the venue, but wasn’t giving any secrets away. ‘Miss Middleton paid a private visit to Westminster Abbey to consider the options and meet key staff there,’ the spokesperson said. Kate was surrounded by William’s royal aide’s during her trip, as well as royal protection officers, who were assigned to her from the day the engagement announcement was made. 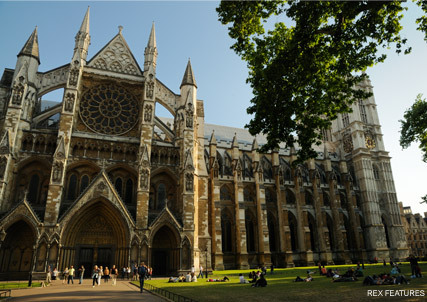 Would you like Westminster Abbey to be Kate and William’s royal wedding venue ? Let us know in the comments box below.